Summer is winding down...it's time to get back in the groove. I am going to miss my big 1st grader once school starts, but there is something to say about routine. We all crave it. 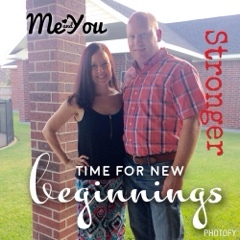 But, there is something new I want to incorporate into our lifestyles - to include my husband into my workouts. His work schedule has been crazy which results in stress and bad choices. So, I may be switching my workout times to the evenings so we can do them together. One year ago, when I began getting serious about working out and considered Beachbody, he was hesitant. Now that he sees my commitment and goals, he did not balk when we discussed this opportunity again a few month ago, and now...I've convinced him that these workouts are legit. Body Beast, and away we go! Two of my friends, Kristin and Page, have successfully encouraged their husbands to workout with them, and they going strong. It's the perfect date night. Since these hubbies have been on board, I thought why not make this a challenge? And since men are competitive, maybe some friendly wagers too? 2. We will complete the Body Beast program from start to finish. BUT, we will pause at the month mark for results and awesome prizes! 4. We will have an awesome meal plan but will also share our own healthy recipes. 5. We will tone and strengthen while supportin' and lovin'!